The Lagoons along near Nebo Road are currently being developed as the site of Mackay’s new Botanical Gardens. The Lagoons has held an important place in Mackay's sugar history as a ready water supply for six sugar mills which graced the edges of the Lagoons from Landsdowne Road to Te Kowai in the late 19th Century. One of these Mills was "Meadowlands" which was located just south of Meadowlands Road, within a short distance, just eastwards of the present Racecourse Mill. Thomas Henry Fitzgerald, E.B. Kennedy and Charles James King in partnership, first planned to develop Meadowlands plantation but King died, aged 28, of a heart complaint and Fitzgerald continued on his own. 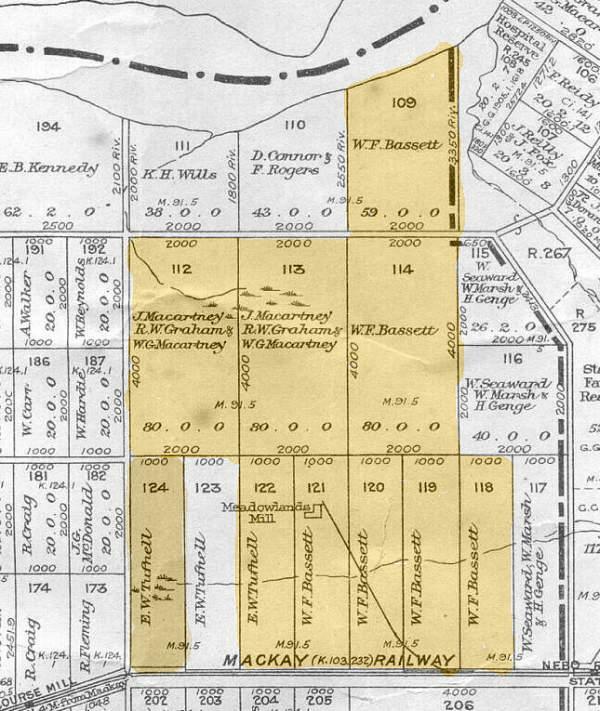 Meadowlands, as Fitzgerald named his plantation, was formed from a number of freehold farming blocks astutely acquired by Fitzgerald, a total of 528 acres. By late September 1869, 114 acres had been ploughed and nine planted with cane. Fitzgerald, assisted by silent financial partners, bought sugar machinery. There was little urgency in erecting the Mill as none of the cane would be mature until 1870. Work on the mill began in July 1870 laying the foundations and transporting the machinery to the site. The mill was completed in late 1870 and was contained in a rectangular building 160 by 31 feet. Crushing began in early November 1870, treating 113 acres of cane from the plantation. In 1875, after practically the whole of the cane in the district had been damaged by rust. Fitzgerald was a large casualty losing his interests in Te Kowai and Alexandra and of course Meadowlands. He quietly left Mackay early in 1876 and his insolvency was advertised on 4th November of that year. The estate was taken over and worked by the Australian Joint Stock Bank. In 1877, it was purchased by William Hyne and Co. William Hyne had owned the Balmoral Mill, which was located near the present site of the Sugar Research Institute and was made redundant by the purchase of Meadowlands. 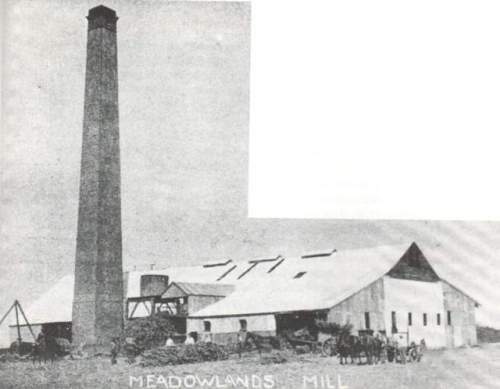 Hyne steadily modernised the Meadowlands mill , so that five years later Meadowlands was the largest and most up-to-date factory then operating in the district. Racecourse farmers were active in having a mill erected under the Central Sugar Mills scheme. The Racecourse Central Sugar Company Limited was registered on 14 October 1886. For William Hyne who had spent a large sum modernising his mill it was a severe blow. Despite the Central Mill being erected on its doorstep, Meadowlands was a great survivor and continued to crush without being overtaken by financial disaster. William Hyne died in 1902 and the Meadowlands Company of Mackay that was registered on 6 July 1906, bought the mill from the estate. The firm erected a derrick to facilitate unloading of cane from drays and wagons. In 1908 built a £4,000 branch line to connect the mill to the Mackay railway at Racecourse siding. The siding included an eighty foot long bridge over the lagoons. Four factories in less than ten miles were in competition for cane. In 1912 when the crop was poor, Racecourse offered a good price to Meadowlands and bought all its cane, to get enough to make crushing worthwhile. It was the beginning of the end for Meadowlands. In 1914 the Racecourse Central Mill proposed taking over Meadowlands for £17,000, and the offer was accepted and the mill closed. All that exists on the site new are the remains of a tunnel, which was used to carry water to the mill. Copy of 1908 Howard parish map showing location of Meadowlands mill and the selection originally taken up by Thomas Henry Fitzgerald. Kerr, John. (1988). A Century of Sugar. Mackay, QLD: Mackay Sugar Co-operative Association Limited. p. 12-15, 36, 38, 40, 42, 57, 72, 80, 93-98, 121, 179. Kerr, John. (1980). Pioneer Pageant. Mackay, QLD: Pioneer Shire Council. p. 46, 53. Manning, K.W. (1983). In Their Own Hands. Farleigh, QLD: Farleigh Co-op Milling Association Ltd. p. 14, 17, 21, 23, 29, 38, 132, 143.
last updated 18 July 2017 .